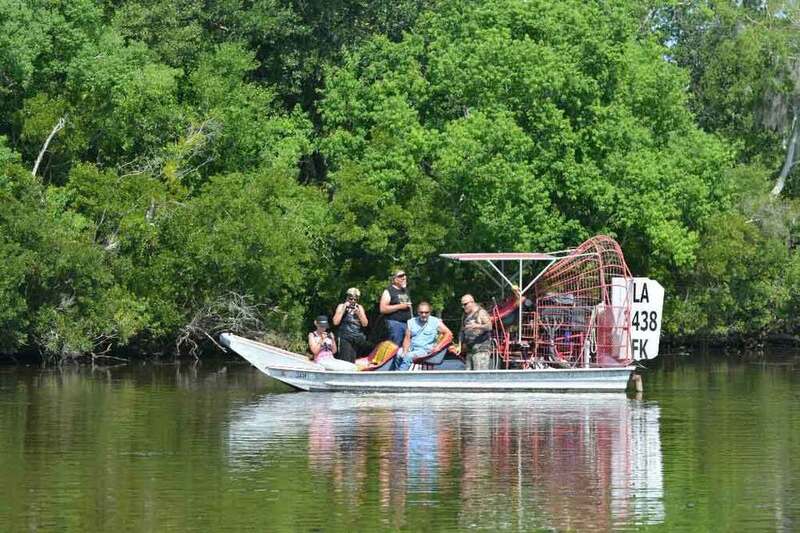 Airboats can take you to places in the swamp that other boats can't get to, giving you the best chance to see alligators and other south Louisiana wildlife. Airboat tours are fast, loud and crazy, but also have moments of quiet beauty. Tickets start at $55. Optional round trip transportation is available from many major hotels in the downtown New Orleans area for a little extra. This tour sells out almost every day and advance reservations are required. Please don't wait. We recommend you book as far in advance as possible. Prices listed are per person. “Quantity” in the field above refers to the number of guests in your party, not the number of boats. To lock in your reservation, we collect a down payment towards the total cost of the tour at the time of your booking. The remaining balance is due at the time of the tour. For Large and Small Airboats this down payment is $30 per person. For 16 Passenger Medium Airboats, it is $25 per person. Let us know how we can help plan your tour, activity or New Orleans vacation. We will get back to you as soon as possible. For faster service, call 888-481-8188. You can also book online 24/7. Airboats are almost like hovercrafts: Airboats go over mud, need less than an inch of water, and take you to places that bigger pontoon boats can't reach, which means you'll see more of the bayou and have a better chance at spotting alligators and other wildlife! Cajun captains: You are in the water for two hours with a Cajun captain, local experts who are incredibly knowledgeable about the native animals and the environment. But they are also a little crazy! These guys are fearless when it comes to the gators and may do things you won't believe. They've been known to occasionally jump in the water. The bayou is beautiful: Spanish moss hangs from Cyprus trees. A Cajun cemetery sits right off the edge of the water. Wildlife abounds: pelicans, owls, turtles,egrets, nutria, and of course, alligators. Alligators! Speaking of gators, you will see them the wild, in captivity, and you'll probably find a baby gator on the boat. You might even get to hold it! Private Tours: Private Tours are available for groups as small as 1 or as large as 100. Private tours are great for bachelor and bachelorette parties, corporate gatherings, church groups, conventions, fans coming in for sporting events, family reunions and more. If your group is 30 people or fewer, we can fit you on one boat. If it's more than 30 people, we can split you across multiple boats. Contact our Group Sales at (504) 507-8308 or reservations@gatorsandghosts.com for a quote. Private tours should be booked as far in advance as possible. * Tour Times/Pick Up Times may differ slightly depending on dock availability. Arrive Early: Guests who are driving themselves out to the dock should arrive 20 minutes early for check in. We work with several docks and address will be provided upon confirmation of your tour. 30-Minute Pick Up Window: Guests who choose round-trip transportation must be in front of their designated pick up location at the time listed for the pick up. There is up to a half-hour pickup window, meaning if your pick up start time is 10:45, our shuttle will be there sometime between 10:45 and 11:15; you must be ready to go by 10:45 otherwise you may miss your pickup and could forfeit your down payment. Our seasonal 6 p.m. tour runs select days (usually weekends) from Memorial Day through Labor Day. Please call 888-481-8188 for availability. Three Different Boat Options To Fit Your Budget: The main difference between the different airboats is how many people are with you on the boat. Our Large Airboats seat a maximum of 30 people. Our 16 Passenger Airboat is in the middle. And our Small Airboats seat 6 to 10 people. All three tours are amazing. We often recommend the Large or 16 Passenger Airboats because you'll see all the same stuff for less money. It's a great value. 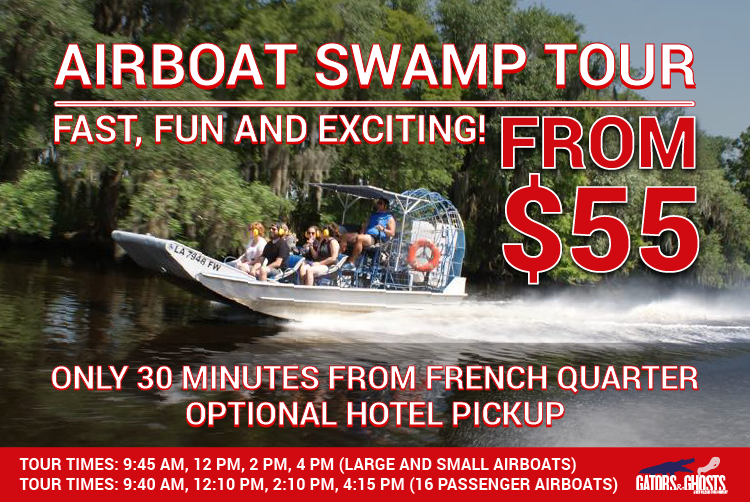 By comparison, the Small Airboat is a little more intimate, a little faster and a little more mobile but it also costs a little more and sells out faster (so book early!). The small boat costs more mostly because there are fewer people per captain. Optional Hotel pickup: Our swamp tours are about a half hour drive from New Orleans. We will pick you up from most French Quarter and CBD hotels, as well as select Garden District hotels. Select swamp boat tours with pickup at Metarie hotels may also be arranged most days, ask us for details. We will guide you to the closest meeting spot if you are not staying in one of our designated pickup locations. Drive Out: You also have the option to drive yourself to the dock, which is about a half hour from New Orleans. Most tours depart from Lafitte, Marrero or Westwego, Louisiana, but we work with multiple tour vendors, so we will provide you the address after checkout. Folks who drive out should arrive at the dock about 20 minutes before the scheduled tour time. Disclaimer: Tours are subject to cancellation in dangerous weather. Airboats are high speed, open boats without a top. Gators and Ghosts LLC and our tour operators are not responsible for any cameras/video equipment lost or damaged due to water, splashes, or rain. Wildlife varies by season: Though we often see alligators sunning themselves on logs even in the dead of winter, the colder it gets, the harder they are to find. This is nature and we cannot guarantee you will see any specific type of animal. That said, the bayou is beautiful year round. You will not get soaking wet or dirty on the tour. Dress for the weather. Our boats are open topped and the speed of the airboat makes it windy. On chilly days, the wind can make it feel colder than it is. On warm days, the sun can make it feel even warmer. Sunscreen is advised. We occasionally go out in light rain. Feel free to bring a poncho. Our captains make the ultimate decision on whether the tour will be cancelled due to weather. We will often go out in light rain but rarely in heavy rain and never when there's lightning. If the tour is cancelled by our captains, we will work to reschedule you. If no alternate time works for you, we will of course refund you. The tour itself on the boat is just under 2 hours. If you choose our hotel pick up transportation option, round trip is a little under 4 hours. Is the price listed per guest? Yes. The prices listed above are per person on the boat. Absolutely. To book a private tour, you essentially buy all the seats on the boat. We have boats of a variety of different sizes from 6 to 30 passengers. We will try to match you with the smallest boat available that will accommodate your group. Call our group sales department at (504) 507-8308 for a quote and more information. We can pick you up at most hotels in the French Quarter and Central Business District. If you are not staying at a hotel, we can figure out which hotel would be closest and arrange to meet you there. We may on occasion be able to pick up at hotels in Metairie or Kenner. Call 888-481-8188 for details. When is the best time of day to see alligators? During the heat of the day in the afternoon is best because alligators are cold-blooded reptiles. But our captains are in the bayou multiple times a day and know the habitats well so we usually find gators at all times of day. It is nature, however, so you never know precisely what you're going to see. Is it true that airboats are too loud and they scare away the wildlife? Not true at all. Though these boats are quite loud at their top speeds (we provide hearing protection for you), when the boat nears an alligator or another animal we want to observe, your captain will cut the engines and you'll quietly glide over to the creature, no harm done. In fact, because airboats are so small and nimble, they can get to many shallow or cramped areas that other (larger, quieter) boats couldn't dream of going into. No promises, but we don't have many guests complain of seasickness after the tour. Airboats are pretty smooth rides and the water is fairly calm as compared to being on a cruise in the ocean. The boats are fast though, so if you are prone to motion sickness in cars, maybe take some Dramamine as a precaution. Do we need bug spray? Probably not, as the bugs aren't too bad in the daytime, in the middle of the water and on a fast moving boat. Still, it can't hurt. Feel free to bring some. What's the difference between an airboat and a fanboat? There isn't one. Same kind of boat. Some folks call it a fanboat. We happen to call it an airboat. No. The American Alligator is what you'll find on our swamp tours, while the American Crocodile can be found most commonly in the tropical regions around Caribbean Sea, Central America and South Amerca. The easiest way to distinguish between the two is by looking at the nose: a croc's nose is narrow compared to the broad nose of a gator. Tour deposits are non-refundable if cancelled by the guest with less than 48 hours notice before scheduled tour time. Groups of six or more must give a week's notice. Tours cancelled by the tour operator are always refundable. FOR GROUPS OF 6 GUESTS OR MORE: You will be subject to a cancellation fee equal to 50 percent of the total tour cost if you cancel with less than 48 hours notice. Because more spots are held aside for large groups, it is much more difficult for us to fill them last minute. You will get credit for any deposit you may have paid when calculating the cancellation fee. You can read our full refund policy in our Frequently Asked Questions. Airboats can take you to places in the swamp that other boats can't get to, giving you the best chance to see alligators and other south Louisiana wildlife. Our tours are fast, loud, and crazy, but also have moments of quiet beauty. Choose from our large, medium, and small airboats to find the right boat for your budget. Private tours are also available. Tickets start at $55 per guest. Optional round-trip transportation is available from many major hotels in the downtown New Orleans area for a little extra. See two plantations with round-trip transportation from the French Quarter. Single plantation tours also available. Oak Alley is famous for its line of 300 year old live oak trees while Laura has amazing history: it was owned for 3 generations by Creole women. Combine a single plantation with a swamp tour. Single plantation tickets start at $67. Find out why New Orleans is the most haunted city in America! Choose from a nighttime cemetery/ghost tour by bus or three different haunted walks in the French Quarter. Graveyard & Ghost Bus Tour: Experience the creepiest haunted tales in New Orleans by bus. Visit one of New Orleans' famed above-ground cemeteries at night. 7 pm & 9:30 pm nightly - $45 per person. Ghost & Vampire Combo French Quarter Walking Tour: Our best value! Explore the French Quarter at night! You'll see places where real life tragic events led to unrestful spirits and unexplained phenomena. 6 pm & 8 pm nightly - $16 per person ($6 per person due at checkout, balance payable at time of tour). Vampires of The French Quarter Walking Tour: You'll learn the stories in "Interview With A Vampire" have some historical truth to them. You'll also see the famous convent where vampires are rumored to live by day. But what about at night? 8:30 p.m. nightly - $25 per person. Ghost & Legends Walking Tour: Take in the haunted legends that simply won't die on this theatrical French Quarter walking ghost tour. This tour skips the vampires and focuses on the most famous historical hauntings. 6 pm & 8 pm nightly - $25 per person. All the gory details for each tour can be found below. Visit St. Louis No. 1, the oldest and most famous cemetery in New Orleans, home to Voodoo Queen Marie Laveau's tomb. This cemetery is closed to the general public but you can see it on one of our Archdiocese -approved tours. Tickets start at $20 per person. Tours run Mon-Sat at 11 a.m. and 1 p.m. or Sundays at 10 a.m.
Our guided 2 and 3 hour city tours get you off Bourbon Street and show you the real New Orleans: French Quarter, Garden District, City Park, St. Louis Cemetery No. 3, and areas around the 9th Ward that have rebuilt after being destroyed during hurricane Katrina. Adults: $46. Children 12 and under: $30. Deposit of $20 for adults or $5 for children per ticket due at checkout with the remaining balance due at time of tour. Adult: Originally $50, now only $45. Children 12 and under: $30. Deposit of $20 for adults or $10 for children per ticket due at checkout with the remaining balance due at time of tour. *Because the cemetery closes at 3 PM, the 2:20 PM tour is unable to go into the cemetery. Chris Owens is a New Orleans legend. She's performed for some of the most famous celebrities and historical figures over the years. Her show is a song and dance, Las Vegas-style variety show. You will not believe the energy Chris Owens has! Her electrifying one-woman show is set to jazz, blues, rock, country, top 40 pop and latin music. She is a dazzling, talking, singing, dancing, sparkling explosion of perpetual motion. Town & Country described Chris Owens as "beauty in motion to a frenetic tempo." Newsweek declared her an "international singing and dancing sensation.